President Bush's endorsement of John McCain last week could prove to be as much of a curse for the Arizona senator and Republican presidential nominee-elect as a blessing. While the president's endorsement could help McCain raise much-needed money and rally still-distrustful conservatives to his side, Bush's dismal job-approval ratings -- at this point the lowest since his father's at 32 percent, according to the latest Gallup Poll -- could effectively shackle McCain with a proverbial ball-and-chain that could cost him the November election. Already, the Democratic National Committee -- in the opening salvo of its determined campaign to paint a McCain presidency as a third Bush term -- posted a video of the unpopular Bush's backing of McCain on its Web site. But Democrats aren't the only ones targeting McCain for defeat in November. Angry supporters of the Boeing Company -- including some Republicans -- are also determined to stop the GOP nominee-elect's bid for the White House over the Chicago-based aircraft maker's loss of a $35 billion contract to build a new generation of Air Force refueling tankers to the parent company of its European arch-rival, Airbus. And some hard-line social conservatives, such as Representative Tom Tancredo (R-Colorado) and Focus on the Family's Dr. James Dobson, have vowed they won't support McCain under any circumstances because of McCain's refusal to back their call for the expulsion of the estimated 12 million illegal immigrants living in the U.S. and for a constitutional amendment banning same-gender marriage. Tancredo, one of McCain's rivals for the GOP nomination who is a fierce advocate for deporting all illegal immigrants, dropped out of the race in December and announced that he will not seek re-election to his House seat. Dobson, who vowed that he "cannot, and will not" vote for McCain "as a matter of conscience," reiterated last week that he will stay home rather than vote in the November election now that McCain is the nominee-elect. The European Aeronautic Defense and Space Company (EADS) and its U.S. partner, Los Angeles-based Northrop Grumman, won a competition with Boeing on February 29 to build the refueling planes in one of the biggest Pentagon contracts in decades. The unexpected decision has sparked outrage from union halls to the halls of Congress over the impact on U.S. jobs, prestige and national security. EADS and Northrop insist, however, that about 60 percent of their tankers will be built in the U.S.
An unusual bipartisan coalition of Boeing supporters in Congress are directing their wrath at McCain for scuttling an earlier deal in 2004 that would have let Boeing build the next generation of Air Force refueling tankers. Boeing now will miss out on a deal that it says would have supported 44,000 new and existing jobs at the company and suppliers in 40 states. House Speaker Nancy Pelosi (D-California), echoing the thoughts of many congressional Democrats, said the earlier tanker deal was "on course for Boeing" before McCain started railing against it. "I mean, the thought was that it would be a domestic supplier for it," Pelosi told reporters. "Senator McCain intervened, and now we have a situation where the contract . . .may be outsourced." Members of Congress from the affected states -- Republicans and Democrats alike -- were even more scathing in their criticism of the Arizona senator. "I hope the voters of this state remember what John McCain has done to them and their jobs," said Representative Norman Dicks (D-Washington), whose state would have been home to the tanker program and gained about 9,000 jobs. "Having made sure that Iraq gets new schools, roads, bridges and dams that we deny America, now we are making sure that France gets the jobs that Americans used to have," said Representative Rahm Emanuel (D-Illinois). "We are sending the jobs overseas, all because John McCain demanded it." Representative Dave Reichert (R-Washington) was just as furious. "John McCain will be the nominee and I will support him, but if McCain believes that Airbus or EADS is the company for our Air Force tanker program he's flat-out wrong — and I'll tell him that to his face," said Reichert. Representative Todd Tiahrt (R-Kansas), whose district includes a Boeing plant that could have gained hundreds of new jobs from the tanker program, said McCain's role in killing the 2004 Boeing deal is likely to become an election issue. "I think we absolutely will hear more about it," Tiahrt said. "We'll hear it mostly from the Democrats and they have every right to be concerned." Sure enough, both of the leading Democratic presidential candidates, Senators Barack Obama of Illinois and Hillary Rodham Clinton of New York, have criticized the Air Force's decision. For his part, McCain called the blasts against him over his role in killing the Boeing deal off-base, insisting that the deal was the kind of pork-barrel spending that he has opposed for years and has made a major plank in his presidential campaign -- and that the Boeing deal was particularly rife with corruption. McCain has run ads touting his role in fighting "pork" such as the tanker project and cited the deal in a recent GOP debate. "I saved the taxpayers $6 billion in a bogus tanker deal," he said. "[With] all due respect to the Washington delegation, they vigorously defended the process before — which turned out to be corrupt — which would have cost the taxpayers more than $6 billion and ended up with people in federal prison," he said. "I'm the one that fought against that ... for years and brought down a corrupt contract." McCain scuttled the 2004 deal after revelations that a former Boeing executive improperly recruited an Air Force official while she was still overseeing contracts involving prospective Boeing deals. The former Air Force official, Darleen Druyun, and a top Boeing executive both served time in prison, and the scandal led to the departure of Boeing's chief executive and several top Air Force officials. Keith Ashdown of the watchdog group Taxpayers for Common Sense, said Boeing executives who broke the law were to blame for the demise of the tanker contract — not McCain. "This was theirs from day one," he said. "This idea that any lawmaker is to blame is a joke." Nonetheless, McCain's opposition to the Boeing contract could hurt him with voters in Washington and other states affected by the tanker program, said Todd Donovan, a political science professor at Western Washington University, who noted that Boeing would have performed much of the work in Everett, Washington and Wichita, Kansas, and used Pratt & Whitney engines built in Connecticut. Significant work also was slated for Texas. "If he can be painted as somehow being associated with job losses ... it could hurt him on the margins," Donovan said. But McCain's role in the tanker deal didn't bother Alabama politicians, including Republican Governor Bob Riley, who endorsed McCain three days after the Air Force contract was announced. The EADS-Northrop tanker, based on the Airbus A330, will be built in Mobile, Alabama, where it will produce 2,000 new jobs, and support 25,000 jobs at suppliers nationwide. Can McCain Close His Huge Money Gap With the Democrats? The day after clinching the GOP nomination last Tuesday with victories in Texas, Ohio, Rhode Island and Vermont, McCain traveled to Washington to receive at the White House the endorsement of the man to whom he lost the nomination in a bitterly-fought contest eight years ago. McCain stood stiffly in the Rose Garden as Bush hailed him for showing "incredible courage and strength of character and perseverance" during the GOP primary campaign. 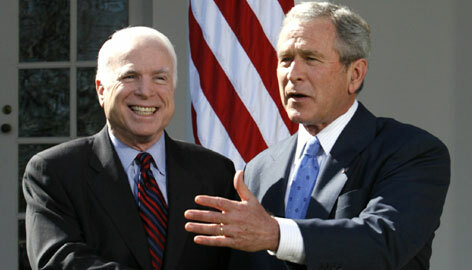 "A while back, I don't think many people would have thought that John McCain would be here as the nominee," Bush said. McCain said he welcomes Bush's help, particularly with fundraising. Bush helped raise $66 million for the Republican National Committee and GOP candidates last year. Money has been a serious challenge for McCain and for Republicans in general this election cycle. Through January, McCain had raised $54 million, according to reports filed with the Federal Election Commission -- a figure easily dwarfed by Obama and Clinton, who've raised $138 million and $135 million, respectively. Last month alone, Obama raised $55 million, and Clinton $35 million. McCain, by contrast, was on track to raise only $12 million, about the same as in January, according to his campaign. McCain recently retained Cincinnati businessman Mercer Reynolds as his national finance co-chairman. As Bush's money man in 2004, Reynolds helped raise a record $273 million -- a record that has since been matched by the combined coffers of Obama and Clinton -- by using "pioneers" who collected more than $100,000 in contributions and "rangers" who raised $200,000. Grover Norquist, a leading conservative activist and president of Americans for Tax Reform, said Bush's stamp of approval helps McCain win over the 32 percent of Americans who continue to stand by the president. Bush remains popular with Republicans and conservatives -- 73 percent and 57 percent, respectively -- in the latest USA Today/Gallup Poll. But Republicans make up only 27 percent of the general electorate, thus McCain must win the support of independents, who make up 32 percent of the voters. "McCain needs to solidify his Republican base and then add independents and Reagan Democrats to it," Norquist said. "He needs all of the 32 and a third of the 68." McCain's biggest problem: Independents are leaning toward the Democrats by a nearly two-to-one margin, fueled mainly by concerns over the economy and by continued opposition to the war in Iraq. McCain's fierce support for Bush's troop "surge" and opposition to a withdrawal of U.S. troops is unlikely to sit well with voters fed up with the war and determined to bring it to a end as soon as possible. And McCain has to be able to win over independents -- the majority of whom are moderates -- without alienating the GOP's conservative base, and vice-versa. That may not be possible, according to Stacie Paxton of the Democratic National Committee. "He's having to walk a tightrope" between conservatives and independents, said Paxton. "We'll be making it clear every step of the way whose side he's on." And if, as now is widely feared, the economy goes south between now and the GOP convention in September, nothing McCain does in the fall campaign will get him elected. That's because of a cruel reality of American politics that dates back to the Great Depression of the 1930s: That the party in control of the White House loses when the economy goes sour on its watch. Recessions in 1952 and 1980 (the latter dooming Jimmy Carter's bid for re-election) cost the Democrats the White House, while similar downturns in 1976 and 1992 (the latter killing George H.W. Bush's hopes for a second term) proved costly to the Republicans. His critics and allies alike worry that McCain, who will turn 72 in August and would become the oldest president in American history if elected, may not live long enough to finish his term, given the physical and psychological toll that the tremendous demands of the job places on a president. But experts on aging have concluded that McCain should not only be fit enough to complete two four-year terms, he should also have at least five years left over for a comfortable retirement. Despite his grueling personal history as a Vietnamese prisoner of war and later as a sufferer of skin cancer, McCain has “a very good chance for a very long life,” said Jay Olshansky, a professor of epidemiology at the University of Illinois at Chicago School of Public Health and the author of numerous research papers on aging and mortality. Yet all the evidence from more than a century of U.S. population statistics indicates that McCain belongs to a group that has been dubbed “the alpha geezers.” More than a third of Americans now live past the age of 85 and many of them remain active well beyond retirement age. In fact, the fastest-growing segment of the U.S. population now are centengenarians -- people aged 100 and older. On the other hand, since the dawn of the nuclear age, every U.S. president, from Harry Truman to George W. Bush, has physically aged more rapidly while in office than they otherwise likely would. Ironically, the last president to die in office from natural causes was Franklin D. Roosevelt, who died from a cerebral hemmorage in April 1945 -- three months before the first atomic bomb test explosion in New Mexico and four months before the atomic bombings of Hiroshima and Nagasaki near the end of World War II. And longtime consumer advocate Ralph Nader, who announced his third run for the White House two weeks ago, is even older than McCain. Nader turned 76 two days after announcing his candidacy on NBC's "Meet the Press." But because Nader, as an independent or third-party candidate, stands little chance of getting elected, his age isn't likely to be an issue.